Delaware Arts Info: "HONK" If You Like DTC's New Family Production -- We Do! "HONK" If You Like DTC's New Family Production -- We Do! Erin is a mom of 4 kids and works as a Business Processor for Point to Point Wealth Management in Wilmington. When not at work or home, she can usually be found costuming her kids' shows at the Delaware Children's Theater. Ellie is an 8th Grade Vocal Major and Maggie is a 7th Grade Piano major at Cab Calloway School of the Arts. Have you ever felt like an ugly duckling, like you are different and you don’t fit in? That pretty much describes me from age 9 to age 16. Gangly, with a bad perm and glasses, I devoured stories like The Ugly Duckling to help keep the hope alive that some day I would fit in. 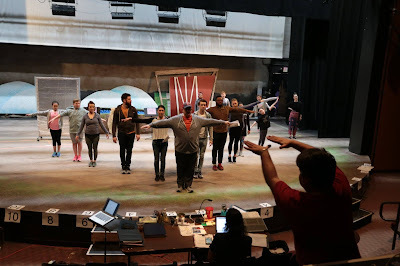 The HONK cast rehearses "Wild Goose Chase" at Delaware Theatre Company. Because of this, I was very excited to get to meet two of the stars of Delaware Theatre Company’s Honk: The Ugly Duckling Musical to hear about what makes this show so special. I was extra excited to have my daughter Ellie with me to ask all the questions. Kim Carson from Hellertown, Pennsylvania, plays Ida, a mom trying to keep her ducks in a row. Camiel Warren-Taylor from West Chester, Pennsylvania, is “Downy”, Ugly’s sassy sister. Kim is a veteran of DTC and is the winner of the 2018 Barrymore Award for Outstanding Performance in a Musical as Helen in Fun Home at the Arden Theatre Company. She said that being a mom to 2-year-old Johnny has made her understand her role as Ida, Ugly’s mother, in a different way. “Bud [our director] asked me if I would be as emotional when Ida thinks Ugly is dead, and I think that those emotions are just so much closer to the surface now” she said. Camiel likes how Ugly handles the teasing and taunting from the others. She said that she has been teased for her name, but she as she says, “There is a reason for my difference and it makes me special.” Camiel is a spitfire with big dreams, and I can’t wait to see her make her DTC debut. Honk: The Ugly Duckling Musical is the kind of show that is so entertaining that you don’t really notice you are getting a lesson along with it. The music is interesting enough to keep adults' attention and kids will love the adorable characters. Honk: The Ugly Duckling Musical opens April 17 and runs through May 12, 2019. Delaware Theatre Company is offering a “relaxed performance” on April 30 for ducklings and their families who would like a sensory-friendly performance. Tickets start at $25 ($20 for student tickets with valid ID) and can be purchased at www.delawaretheatre.org or by calling 302.594.1100.